Our good friend, Deb Legge, knows all of the secret excuses you use to keep from switching to private pay – and she has answers for all of them. And if you’re looking to get more private pay clients, be sure to check out Deb’s course on Transitioning to a Private Pay Private Practice. 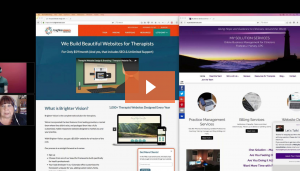 With the internet readily available at our fingertips, therapists are able to learn from one another’s successes and failures so that they too can be successful in private practice. In this on-demand webinar, Deb Legge will share her experiences of proven self-promotion strategies that have enabled her to be a successful private practice owner. It’s so important in this day and age to have a solid understanding of how to protect your information and identity from online threats such as viruses and hackers. Brian Smith, CTO at Hushmail is here to provide us with 5 private practice security must-knows.